My most favorite part of our Thanksgiving meal this year was dessert! My husband’s step father treats us to his homemade desserts almost weekly and I am always impressed when he shares a new recipe. Thanksgiving was no exception. He made an amazing cannoli cake and sent a copy of his recipe home with me. This cake will likely become your new favorite! 1) Prepare and bake cake mix according to package directions, using two greased and floured 9 inch round baking pans. Cool for 10 minutes before removing from pans to wire racks to cool completely. 2) Prepare filling. In a large bowl, combine the ricotta cheese, confectioners’ sugar, cinnamon and extracts. Stir in chocolate. Set aside. 3) Prepare frosting. Beat mascarpone cheese, confectioners’ sugar, milk and extracts on medium speed until creamy (do not overmix). Set aside. 4) Place one cake layer on a serving plate; spread with 1 cup filling. Top with second cake layer. Spread remaining filling over top of cake to within 1 inch of edges. Frost sides and top edge of cake with 2 cups frosting. 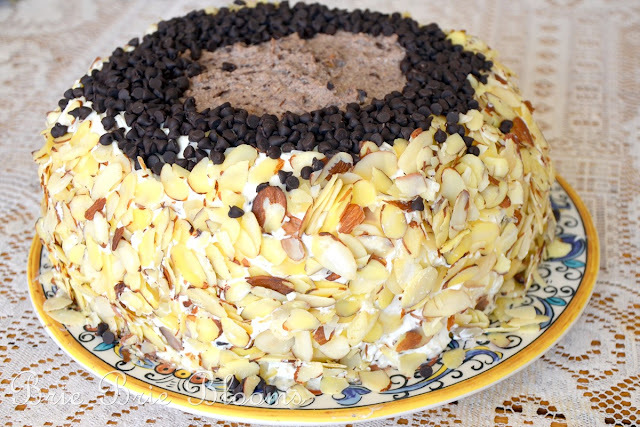 5) Press almonds into sides of cake. Sprinkle chocolate chips over top. Refrigerate until serving. It is pretty AND delicious! Be sure to send any leftovers home with guests! 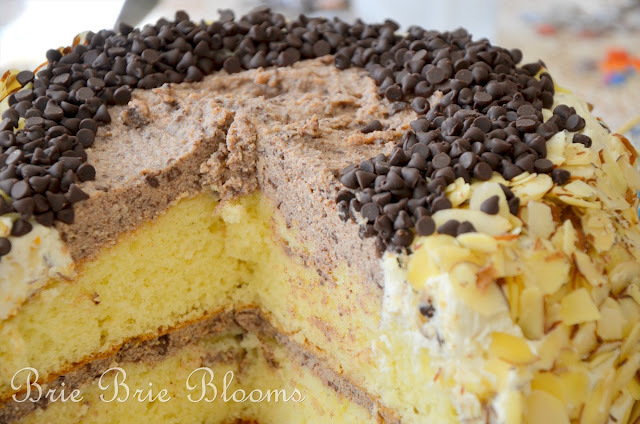 When will you serve your next Cannoli cake?